Well not being one who likes to fill my body with all sorts of chemicals, I decided to make the switch from plastic to stainless steel bottles. In doing so, I tried out a huge number of different bottles and found out that most of them sucked. From problems with the bottles rusting to lids that were so sharp you could cut your face off, it seemed that the perfect bottle was a lost cause. Then I came across the Klean Kanteen, and I was hooked. Clean Tasting Water – If you’ve tried a number of commercial water bottles, I’m sure you’ve noticed that some of them can make your water taste downright nasty. If you enjoy the taste of plastic, then don’t buy the Klean Kanteen. If you like water that actually tastes like water, then this bottle will do the trick. Even after a long day of hiking in the heat, my water still tastes fresh. That being said, for the first couple of days the bottle did have a slight metallic taste, but that went away after a couple of uses. If you do find it to be a problem, I suggest popping a tea bag into the bottle before you leave the house. I noticed that it really helped get rid of the metallic taste a lot quicker. Light Weight – For a stainless steel bottle, this thing is really light. In fact, it’s actually lighter than a number of the plastic ones I’ve collected over the years. Weight is often something that light-hikers obsess over, so I know this is an important consideration for some of you out there. The Bottles Design – I know, now it really sounds like I’ve turned into a cheerleader for the Klean Kanteen; while it may sound like I’m over-hyping the bottle, compared to some of the other bottles I have this one is noticeably different. It’s rock solid construction makes it a good choose for anyone who does a lot of backcountry adventuring, where gear can quickly get beaten up and damaged. Another thing I really like about the design was the lid. I have a bunch of stainless steel bottles from various competitors, and a lot of them are pretty uncomfortable to drink out of. One of the competing brand’s lid was so sharp that it was actually almost dangerous to drink out of. If you look at the picture below, you can see how smooth the rounded lip on this bottle is. Rust Free – Generally stainless steel products are pretty resistant to rusting but for some reason a lot of the bottles I’ve tried rust pretty quickly. The Klean Kanteen has never had that problem. I have been using my Klean Kanteen for a couple of years now, one time forgetting it in my truck for over a month filled with water, and so far I’ve never had a problem with rust. 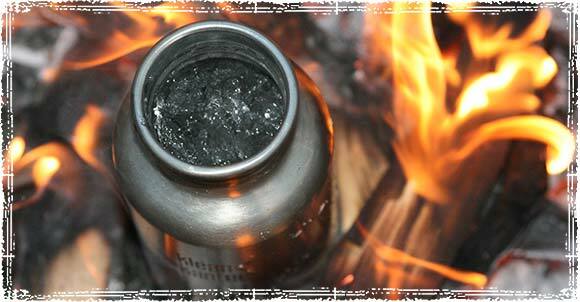 Boiling Water in the Bottle – This is one of the main reason I switched from plastic to stainless steel. In a survival situation, these bottles can be used to boil water. Some of the other brands are made of aluminum and baked epoxy that cannot be used to cook with. I’ve used mine numerous times over the fire and it’s still as strong as the day I got it. Putting it directly in the fire will cause a small amount of discoloration to the outside of the bottle, but you’re sticking it in the middle of a fire so you have to expect some sort of discoloration. It in no way effects the performance of the bottle, and for the most part, it’s pretty easy to clean with a little soapy water. The Klean Kanteen comes in a number of sizes and has a variety of cool caps and accessories. We liked the loop cap the best because it can be hooked to the straps on your backpack for easy access while walking. Where to buy the Klean Kanteen? Hey thanks for the tip! I bought one last week and you are right these bottles are a heck of alot better than what I was using. Hello! Thanks for the tips- I bought a Klean Kanteen 27 oz with the Sport Top 2.0, this has to be the best flow on the market! Plastic Canteen+Metal Canteen Cup is the way to go people… They fit together taking half the space and a plastic canteen wont break as easily as a metal one would. It sounds stupid but metal water bottles are notorious for rupturing if you ding it.. Dont be a fool. Theres a reason why US military canteens are tough plastic not metal.. They used to make the canteens out of metal. They only went to plastic for cost saving and it is not noisy like metal if you bang them around.I got to use both while in the military These metal water bottles are great. No military issue the plastic ones because the government is cheap and knows that dumb Privets will lose them on the first day. No one actually uses the cup. Privates is spelled like you see it here. Yes, Kleen Kanteen makes several 32 oz. bottles. I take a plastic canteen as well as a hydration pack. Never been caught short yet. I’ve had a big Klean Kanteen for a few years. I’ve dropped it a lot (classrooms, roads, rocks, and rivers) and never had any issues. I also use it as my sole boil pot while backpacking. It saves space (is not clear so saves on water treatment) and is light. Good choice for backpacking. Why doesn’t Kleen Kanteen make a 32 oz bottle? It’s a no-brainer. It boggles the mind. They have a 64 oz. Why not a 32 oz bottle half that size? I’d get a Klean Kanteen IF they made a 32 oz. size, but they don’t. Why does it matter you ask? Because, many water treatments are setup to treat 1 qt or 32 oz batches. Dude, buy the wide mouth 40oz., it is the same diameter as the 32oz. polymer so it will fit in the same cups. Plus the wide mouth fits MSR water filter/pumps. OR just buy the 64oz. wide mouth and boil the water on your fire or stove. Bottom line is that this bottle has the ability to replace your other synthetic water storage containers/filters/tabs/etc. in one peice of equipment. Boil it man! Just boil it! I got caught in late July with a broken water filter. Boiling water in hot weather is NOT the way to go. I get the concerns with the sterilization tabs. The first Klean Kanteen was 750ml so that it could fit an entire bottle of wine. When you are on the move or inclimate weather or a host of other reasons boiling is not always an option. Why not 32 oz. ? The water treatments will work on 40 oz just as well as 32. Relax. I just bought a Klean Kanteen, and the literature says not to boil with it?? I bought the bare bones one too ,with no coating or anything. Did yours say that too? is it just a way for them to cover their asses should it fail while its boiling? Sounds like you bought a double walled one (insulated) You can’t use the double walled for boiling water in, only the single walled models. You probably bought the insulated bottle which has a double wall design, it’s meant to be used as a thermos and is not the same thing as what’s featured in this review. They’re still great bottles; I use them all the time when I’m fishing in the heat and want to keep some water cold throughout the day, you just can’t use a double wall bottle to cook with. Does the heat of the fire usually heat the bottle to where it kills all the little critters in the threads or do you need to build up the flames to the threads? Just bring the water to the boil and the critters will be dead. I like the Klean Kanteen but I would much rather buy American and the Klean Kanteen is made in china…. I’d love to find a survival type site that only used American made.. Lets keep it at home!!!! As soon as you find one, let us know. I think you’ll find that a 100% surgical stainless American made bottle will fetch well north of $50. But you would pay that, right? Right. Got the 32oz till 2 years. From the 1st day to now, I got a metallic taste. It’s the single wall version, not insulated, and the notice says to not boil it. I need to make some tests. The single wall Klean canteens Do Not say you cannot boil water. They do say they not intended for hot liquids. That’s because you need insulated ones to store hot liquids. Clean properly with scotch brite. Never a metal taste. Just like stainless pots and pans. My 40oz has been boiled 20 times. No taste no problem. The Nalgene Stainless 38oz do have leaking / cracking problems at threads. The metal taste is psychosomatic. This type of stainless cannot pass flavor to the liquid as it is chemically inert. It does say not to boil, written directions inside the bottle. One wouldn’t know that just looking at the bottle and directions on the outside. I was very excited about adding this to my EDC as my wife owns a Hydro Flask and I wanted to compare the two. They both work great however to my disappointment both of these brands are made in China. I don’t want to be in possession of Chinese property when they invade and ask for their stuff back, so as usual, I filled them full of piss and chucked them in the neighbors yard. You ate a lot of paste as a child, didn’t you? How you made it to adulthood is beyond me. 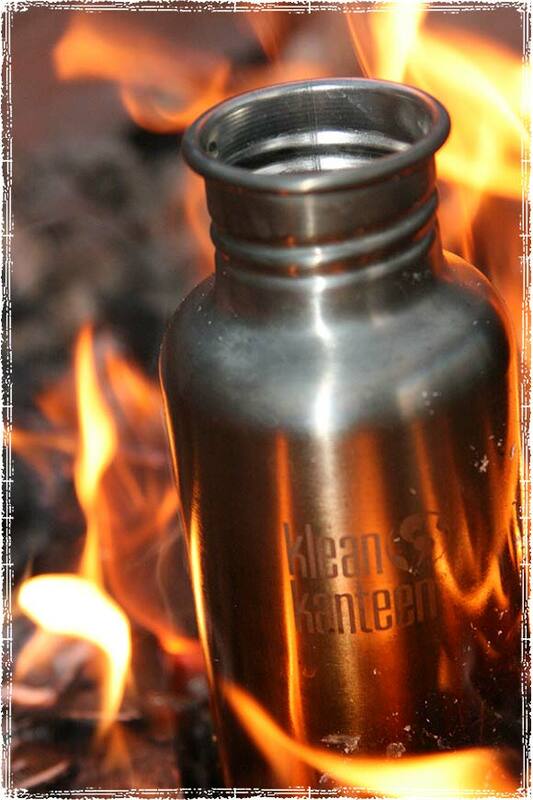 klean kanteen is a great water bottle for many things, here boiling water is especially practical. brass wire seems to last the longest. That said, I think they are referring to the entire bottle with lid included.